2018 Fall Issue NOW AVAILABLE! Click here to read. The 2018 Fall Issue has an overview of the annual meeting held in Racine Wisconsin and gives us a look at of some the different IFBA clubs activities. 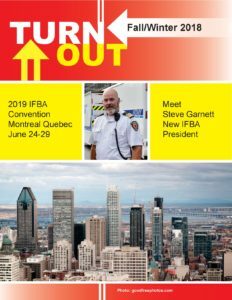 It also has information on our upcoming June 2019 convention in Montreal! ATTENTION WRITERS… Submission deadline for the Spring issue of TURN OUT is June 1st, 2019. A target publication date is June 15th. ARTICLES AND PICTURES for Turn Out are always welcome. Do you want to get published in TURN OUT? Attend the convention, write an article about your experience or write a page or two about what your club is doing. Be sure to include some pictures.